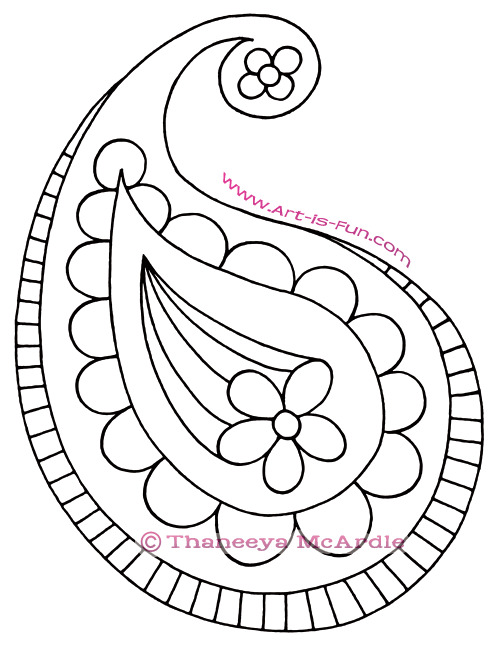 Learn how to draw paisley in 7 easy steps! In this step-by-step drawing lesson you'll learn how to doodle whimsical paisley designs like the one you see on the right. 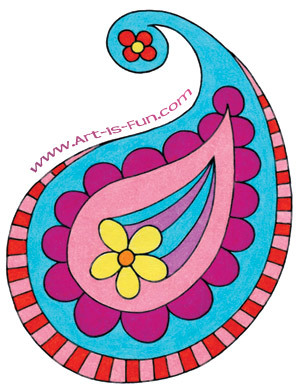 This lesson is an excerpt from Draw Groovy, my 64-page book containing easy step-by-step lessons on how to draw cute, whimsical images decorated with fun patterns and colorful designs! 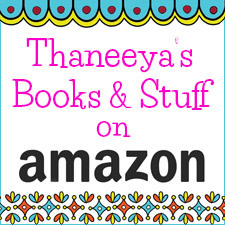 Draw Groovy is available on Amazon, Book Depository, Barnes & Noble, and other fine booksellers! 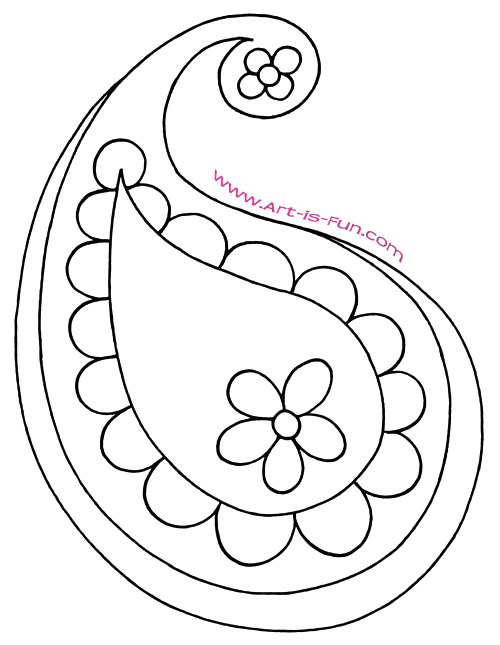 You can also download a free PDF of this paisley drawing lesson near the bottom of this page! There are a lot of different ways to draw paisley, with various details you can add to the basic shape, and limitless possibilities in terms of making your paisley unique. In this lesson you'll learn one easy way to draw paisley, and I'll show you several additional paisley drawings that all use the same basic shape, so you can see how you can customize your paisley to look unique. There are so many possibilities for creativity, so let's get started! 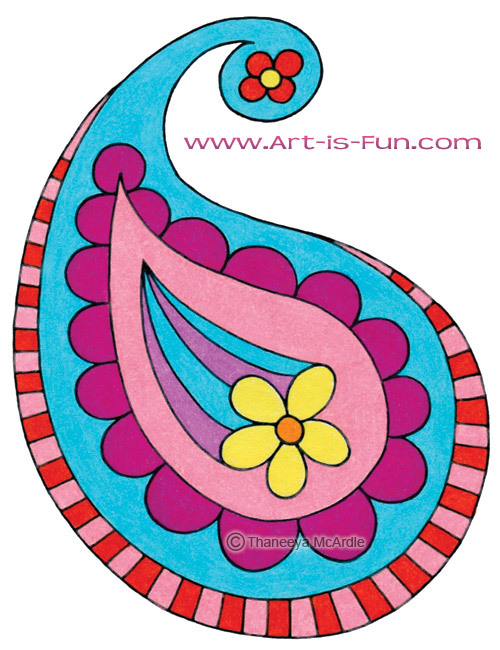 Paisley is a popular shape that frequently appears in trendy patterns, mehendi hand designs and groovy doodles. Sometimes it seems like paisley is everywhere! The basic paisley shape looks like a teardrop or raindrop with a twist at the top. Paisley gained popularity as a pattern several centuries ago, when European explorers and traders transported shawls woven with paisley patterns from the Kashmir region of India to Europe, where it became extremely fashionable. Paisley experienced a revival in popularity during the hippie years when it took on a more modernized appearance with psychedelic connotations. These days, paisley's popularity continues, with paisley appearing on diverse products such as iPhone cases, journals, and clothing and accessories for all ages and both genders. After you draw your paisley, you can color it in with any medium you can think of: markers, gel pens, colored pencils, watercolor pencils, pastels, crayons, paint, or whatever you can get your hands on! Surface: Any type of paper will do - drawing paper, printer paper, cardstock, watercolor paper, etc. 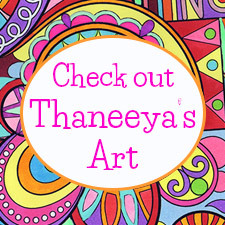 You could also draw on canvas or wood and paint in the colorful details! Without picking up your pencil, bring the curve back up. 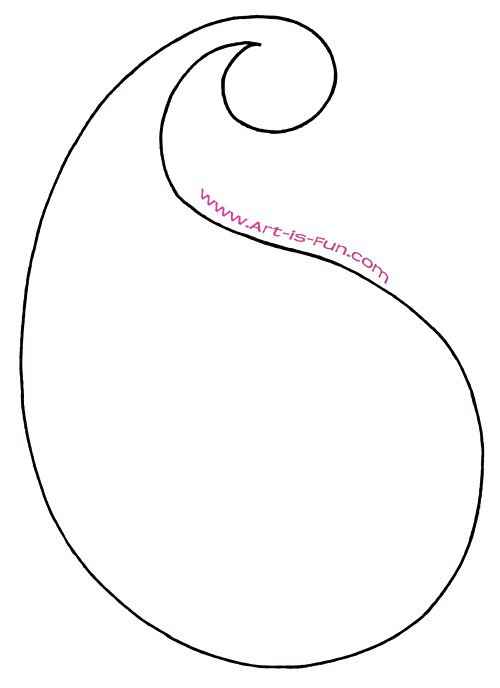 Curve your line so it connects with the very beginning of your drawing. 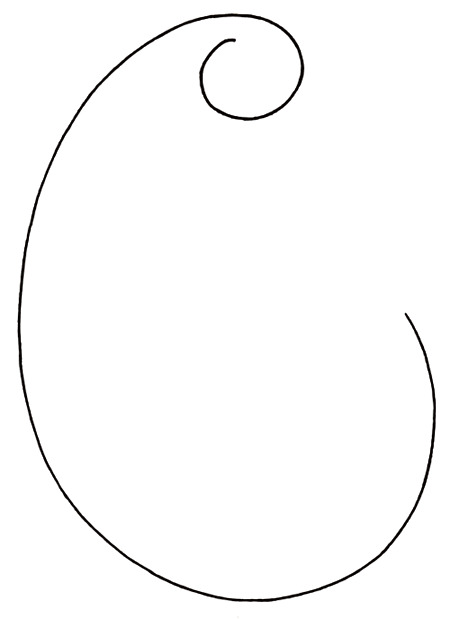 You've drawn a paisley outline! Now the fun really begins - it's time to add more shapes and patterns! Begin to decorate the inside of the paisley. Start with a raindrop shape in the big part of the paisley and a circle in the small part. Add more patterns and shapes, such as flower petals. 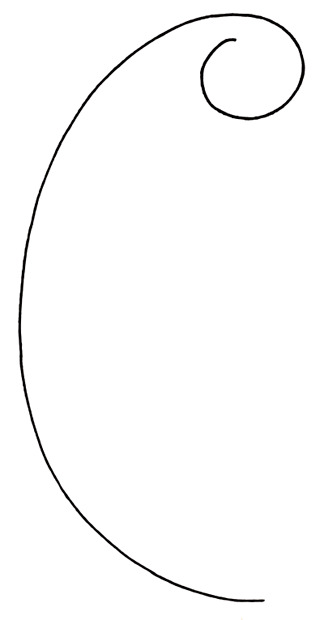 Draw a line around the outside edge of the paisley's big bulge. Here are a few more examples of paisley that were created using the basic shape as described in Steps 1-3, then decorated with different details and colors. See how different they can be, even though they start with the same shape? Let your imagination run wild and see what you can come up with! If you want to cover your whole paper in paisley, rotate your paper after each shape to draw each paisley from a different angle. This adds variety and fun to your pattern! Use a pencil first to doodle ideas. When you're satisfied with your sketch, then use more permanent materials like markers, colored pencils, ink or paint to outline your paisley and color it in. Experiment with different color schemes. 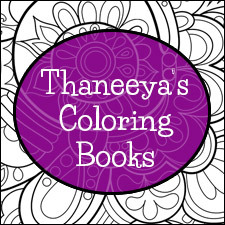 Try a limited color scheme (using just 4-5 colors), or try using just one color (drawing with silver gel pen on black paper, for example). Doodle paisley in one color, and try to get as intricate as you can to create cool, mesmerizing paisley patterns. Color it in when you're finished. After you draw some detail paisley patterns in one color, photocopy them so you can color the same design with different colors. If you want some help and inspiration with drawing patterns, check out my lesson on How to Draw Patterns like the one below! This lesson is provided for educational purposes only. Please have lots of fun with it, but don't copy my paisley exactly and try to sell them as your own, because that would be copyright infringement. Copying for purely educational purposes is okay, as long as I am properly credited as the original artist if you want to post the image online. Follow this lesson to create paisley with your own unique combination of colors and designs, that suits your style and personality. Make it your own! 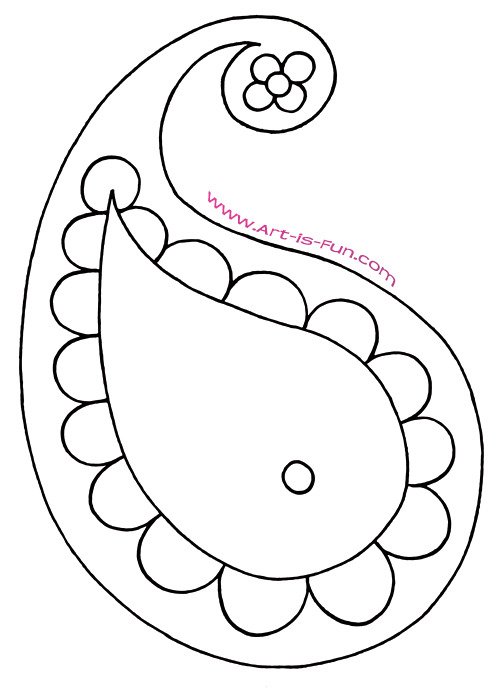 I hope you enjoyed this step-by-step lesson on learning how to draw paisley! If you like this lesson, you'll enjoy Draw Groovy, my 64-page book containing easy step-by-step lessons on how to draw cute, whimsical images decorated with fun patterns and colorful designs. 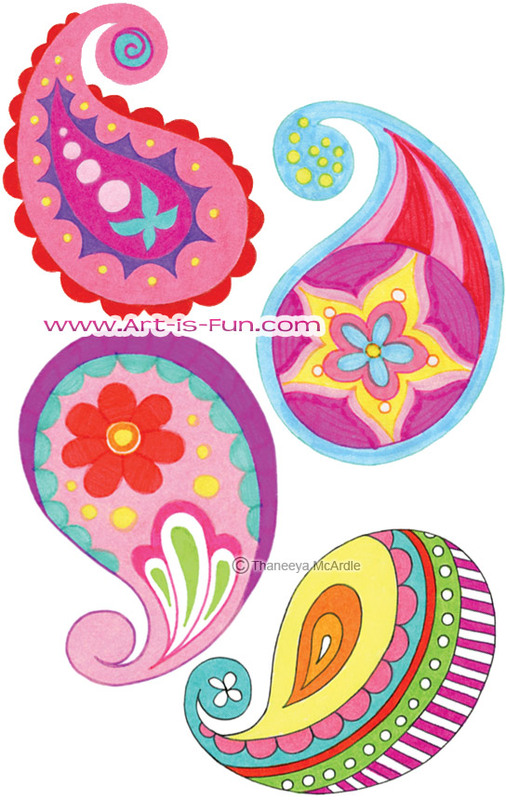 Click here to download a free PDF of this lesson on how to draw paisley as it appears in my book, Draw Groovy! Click here for more drawing lessons! 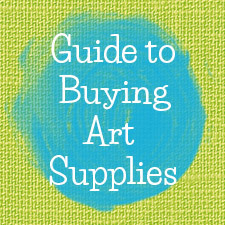 Click here to explore the wonderful world of abstract art!